Carp, a dead-end town with a couple thousand inhabitants, is one of the most boring towns ever. To spicen things up and to give young High School graduates a chance to escape town the game Panic is played. 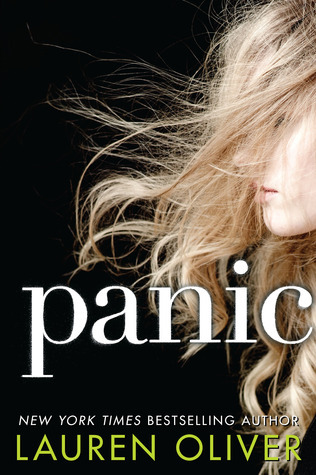 Only one person can win Panic, a game that’s not exaclty easy to play. In the previous years there have been plenty of accidents and occasionaly even deaths. The story is told from the POV of Heather and Dodge, two of the players who have completely different reasons for playing. The book certainly had some thrilling moments in there, but in the end it just didn’t grip me. To me, Panic (the game) just seemed so stupid and reckless. All the characters had their very valid reasons to participate in the game, but I just couldn’t connect with any of them. I felt like the book was telling me over and over again what’s wrong with the people and their lives, instead of letting me explore it through the story. All in all, I would say it’s a fun and short read, but nothing that will stick with you forever. Have you read it? What would you say about it? Never heard of it. But it sounds like the sort of book I’d compare to Hunger Games or Battle Royale and I would still end up picking the latter as the better one. Yeah, probably! I absolutely didn’t like Panic. It was an alright-book, but one should never settle for an okay-story! If you want, I could make some recommendations for some not-scary books. Though that list might include my sci-fi novel if you’re not careful. Not that I wouldn’t appreciate your recommendations, but I still have like 20-30 books on my TBR pile. Well, I got them if you need them. Good luck getting through all those books! Thank you 🙂 I’ll get back to you about it! Thanks so much, also for the recommendation! I’ve actually heard about “Under the Never Sky” from some booktubers, but I was so caught up in my own TBR list that I didn’t pay much attention. I will definitely check out your review!